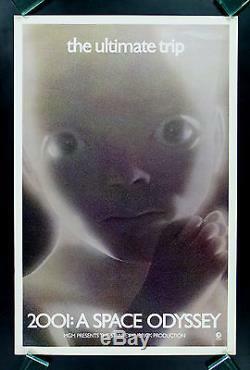 1SH ORIGINAL "STAR CHILD" WILDING MOVIE POSTER 1968. For 1000's of Vintage Movie Posters. If it has any minor defects like pin holes, creases, etc. And they are not mentioned above, they should be visible in the high resolution photo. WE DO NOT SELL REPRODUCTIONS OF ANY KIND. Perfect for a high end home theater. 27 1/16" x 41 1/16". One sheet WILDING ORIGINAL MOVIE POSTER issued by the studio when the film was released and meant for theatrical/wilding display. This is the one everyone wants! One of the rarest one sheets for this film! About 2001: A Space Odyssey Wilding One Sheets (from HA). When MGM decided to revamp the advertising campaign for this blockbuster film in 1969, they chose the tagline The Ultimate Trip. " The "Eye" and the "Star Child posters were conceived for the 1969, 70mm relaunch in New York, while the film was still playing around the country in its original 1968 standard 35mm format. These posters were primarily used for wilding i. Posting on building sites, etc. The "Star Child" was retained for subsequent releases for the next decade and thus the image is the more common of the two. The original printing of the "Eye" and "Star Child" posters have no NSS or other information in the bottom border, as they were created in rush time, not knowing if the campaign would take. These can be very difficult to find in any condition! Or any other markings on this poster. No tears, no tape, no pin holes, no writing, no stains. This poster is a rare surviving "Wilding" poster one that is used primarily for posting on building sites, etc. This type of poster usually never survives as they are torn down or pasted over with a new release. This poster is considered to be within that class and is definitely INVESTMENT QUALITY. This is NOT a reprint or reproduction poster! It is a REAL ORIGINAL MOVIE POSTER issued by the studio when the film was released and meant for theatrical /wilding display. We are absolutely certain it is authentic. We use super strong hi-quality packaging materials including thick cardboard, masonite, and costly pvc plastic pipe. (Please see below for details). It will answer any questions you may have. Please scroll to the bottom of this listing to see if we have made any changes or added any additional information. Please be advised that over 95% of all Original Movie Posters. We can yield for you MUCH MORE than you would get if you auctioned them yourself up to TEN TIMES or more! Let us sell your posters for you! For more information about CineMasterpieces please see. We guarantee that all posters we sell are graded and described accurately. Unless otherwise specified in the description, ALL POSTERS ARE ORIGINAL MOVIE POSTERS original theatrical movie posters that were displayed or meant for display (unused) in theaters at the time the movies were released. We will put in writing that we guarantee it to be an Original Movie Poster. The item "2001 A SPACE ODYSSEY CineMasterpieces 1SH ORIGINAL KUBRICK MOVIE POSTER 1968" is in sale since Sunday, April 04, 2010. This item is in the category "Entertainment Memorabilia\Movie Memorabilia\Posters\Originals-United States\1960-69". The seller is "cinemasterpieces" and is located in Scottsdale, Arizona. This item can be shipped worldwide.